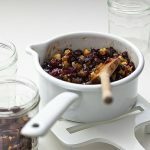 I prefer the flavour of butter to suet in mincemeat – which makes it suitable for vegetarians – but use suet if you wish. The butter makes the mincemeat look slightly cloudy in the jar but this disappears once the mincemeat is cooked in mince pies, etc. Measure all of the ingredients except the alcohol into a large pan. Heat gently, allowing the butter to melt, then simmer very gently, stirring occasionally, for about 10 minutes. 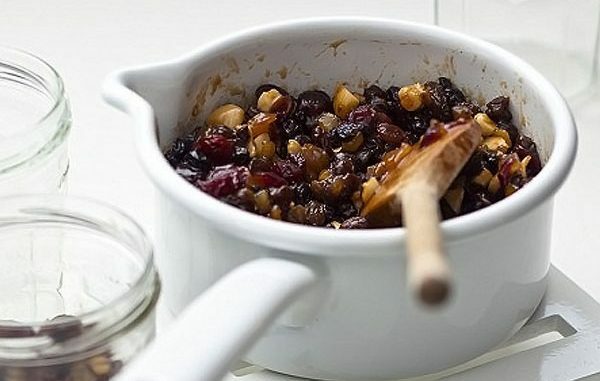 Spoon the mincemeat into sterilised jam jars, seal tightly, label and store in a cool place.